Home » News » Belmont Stakes 2014 Picks and Plays; Triple Crown Threat On The Line Who Will Shine? Belmont Stakes 2014 Picks and Plays; Triple Crown Threat On The Line Who Will Shine? Belmont Stakes Picks and Plays 2014; Triple Crown Threat On The Line Who Will Shine? : The 2014 G1 Belmont Stakes is beginning to take shape and is set for this Saturday, May 7th, 2014 to be raced on the “Big Sandy” in Elmont, New York. This race is the toughest of tough with the colts running 1 1/2 miles (2.4 km) vying for a purse of $1,500,000. The Test of the Champion race follows the Preakness, with a three week break, and the Kentucky Derby with five weeks in-between. The first Belmont Stakes was held at Jerome Park Racetrack in The Bronx, built in 1866 by stock market speculator Leonard Jerome and financed by August Belmont Sr., for whom the race was named. The race continued to be held at Jerome Park until 1890, when it was moved to the nearby facility, Morris Park Racecourse. 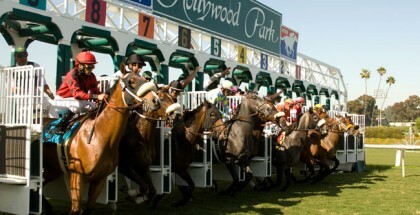 The race remained there until the May 1905 until the opening of the new Belmont Park racetrack here in Elmont, New York, which is on Long Island just outside of Queens, New York. Ride On Curlin, pictured above preparing for the 146th Running of the Belmont Stakes, is Sigi’s top picks for the third and final jewel of the Triple Crown. Kari also likes the colt who comes in with 12-1 odds. Because of the length of the race (one lap around “Big Sandy”, the main track) and because it is the final leg of the Triple Crown, it is called the “Test of the Champion”. Positioning of the horse and the timing of the jockey to make his move for the lead are critical. Most three-year-olds aren’t accustomed to the distance, plus lack the experience and stamina to maintain a winning speed for so long. This race is the tough-as-nails variety and the reason we only have 11 who have won the Triple Crown series. The speed record is held by the infamous Secretariat in 1973 at 2:24.00 which is also the largest margin of victory with 31 lengths over the field. He was beyond WOW. Last year the race was won by Palace Malice in 2:30.70. Interestingly, the two fastest times in the last 10 years were from Birdstone in 2004 in 2:27.50 and his son Summerbird in 2009 in 2:27.54, go figure. Three fillies have won the Belmont: Ruthless in 1867, Tanya in 1905, and Rags to Riches in 2007. By comparison, three fillies have won the Kentucky Derby. The 146th running of the Belmont Stakes has a start time of 6:52 pm, EST and is the 11th race of the day. It follows 9 stakes races and I have to say this card is chock-full of fantastic runners and odds. Sigi and I nailed the superfecta with our picks in the Preakness Stakes with California Chrome, Ride On Curlin, Social Inclusion and General a Rod. We’ve been on a nice hot-streak lately so heres to hoping that continues. With a Triple Crown on the line this Saturday, it’s going to be very exciting to see how the race plays out. It’s been 36 years since Affirmed took the crown home in 1978 and it’s been 19 years since a Kentucky Derby winner also won the Belmont, that being Thunder Gulch in 1995. We decided to each write-up our top four picks, so let’s begin. Ride on Curlin is a horse that always runs very well despite the tough post positions that he has had. In the Preakness he made a strong move and was clearly second 1 ½ lengths behind California Chrome. He stays healthy and strong in the mornings and surely will appreciate the 12 furlongs of the Belmont Stakes. He ran a superb race at Belmont Park in the Champagne Stakes coming off the pace, so he knows the track and he likes it. He’s one of the three horses that is running in all of the Triple Crown races. This boy had a nightmare trip in the Derby, and despite all, was able to get 4th place. His connections made the decision to skip the Preakness to prepare him especially for the Belmont Stakes. His destiny is to be the villian of this story, just like Empire Maker, when he beat Funny Cide in 2003. He’s working very well and his jockey Rajiv Maragh is pretty optimisitic with him. All of the horse racing fans eyes are on this guy. Last year, the pedigree researchers had not spent a buck on him in future bets, but incredibly he beats his bloodline to win the Kentucky Derby and the Preakness. That’s why this sport is so beautiful. In his last race, the Preakness, he felt pressure for the first time, holding off Social Inclusion’s attack in the far turn, and then Ride On Curlin in the stretch. If California Chrome has a perfect trip again, he has a great chance to be a Triple Crown winner. Sadly, the Belmont Stakes lately doesn’t have happy ending stories. Another horse with not the best luck in the Kentucky Derby who had a poor post position and was forced to run wide. Despite all the issues, he was able to manage to run second with the fastest last furlong. Like Wicked Strong, he skipped the Preakness to save all his energy to run the race of his life in the Belmont Stakes. He looks in top form and healthy in the mornings, so a great effort is expected. I’m a sentimental sucker for a Triple Crown winner but I also think it’s his to lose. The son of Lucky Pulpit is coming off a race record of 12:8:1 with his latest romp in the Preakness. That race the huge Chestnut pulled away in his usual fashion to open up lengths on the field. Ride on Curlin came surging forward to to match him stride-for-stride to be denied for second by 1 1/2 lengths. Chrome ran the 1 3/16 miles in 1:54.84. The final time was the fastest since Big Brown’s victory in 1:54.80. So not much else to be said here. 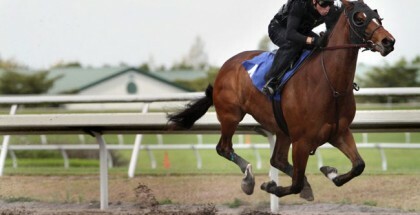 He has a final work on May 31st over the main track breezing 4f in 47.61, 5/31. From what I’ve read from the professional clockers and handicappers, he looks emotionally, physically and mentally, ready to roll from post #2 with his regular rider Espinoza. Last out, this chill boy ran second in the Kentucky Derby where he got the perfect ride coming from a crap post, running relaxed and unhurried in the back, to make an 8 wide smooth move at the final turn closing in fast behind California Chrome. He drew wide in 4 of his last 5 races and was pinched at the start in the Louisiana Derby where he ran 3rd. I doubt we see him at the back of the pack Saturday. He could sit no more than a couple of lengths off Chrome with a nice break, then grind him down in the stretch. He’s much faster than many think and very dangerous in this race. He ran into a huge headwin in the Kentucky Derby and a dead pace to nail that second spot. Not too many have the pedigree to negotiate 1 1/2 miles but he reeks of distance. His sire Master Command is from A.P. Indy plus being inbred to Buckpasser and Secretariat through a few of their daughters. He has a race record of 7:1:2:2 and has one work on this track going 4f in 47:38, 3/25 on June 1st. Exiting post #4, Commanding Curve gets his regular rider Bridgmohan in the irons. I’ve liked this guy since his 6th place finish in the Fountain of Youth. He has a race over this track when running 2nd last out to Tonalist in the Peter Pan Stakes in the slopfest. He broke his maiden second time out at 1 1/8 miles. He has two works over the Belmont surface with the last one on June 1st going 4f in 49.86. He is looking very relaxed and confident and has the pedigree to run all day also being out of A.P. Indy. He’s a nice tracker and if he can build on the kick he showed in the Peter Pan, look-out. Maybe we haven’t seen his best yet? He could be a viable sleeper at an amazing price. The Commish gets Castellano in the saddle breaking from my lucky #8. Last out he was trying to collar California Chrome in the Preakness Stakes to take second. Ride on Curlin drew the far post #10 in that field and new rider Joel Rosario was forced to settle him twice before a sharp rally that left them 1 1/2 lengths short after running 9 lengths faster than he’s ever ran. To come back and match that is tough and he’ll have to run the race of his life. From what I’ve read online he looks fantastic and is taking well to the track. He needs a good trip, up closer and passing a few at the quarter pole. On June 1st he worked 7f in 1:28.03 and has a race record of 11:2:3:4. He’s only been off the board twice. We’ll see how much he has left in the tank when Velazquez, who has 2 Belmont wins under his belt, is up from post # 5. I’m going with California Chrome as my 2014 Belmont Stakes pick to win and nail the Triple Crown . I rarely bet the favorites to win and I won’t start here. However, I can’t help but hope he gets it done. As a lover of this sport, we could really use a nice feel-good happy ending and I hope we get it. He has more than one running style and if he can get a lead with nobody pulling a “Smarty Jones Belmont” to gang up getting him to run early, then he can stalk a soft pace or set his own and take them all the way. My sentimental favorite in this race and who I think could upset is Commanding Curve. I think he’s a lot better than people think and could rock the boat coming in fresh and relaxed. Commissioner and Ride On Curlin are my other top three favorites and I think either could pull an upset. Plays: Odds won’t be great on Chrome so I’ll play against with a $5 exacta 4,5,8/2 plus money across win/place/show on #4 Commanding Curve. I’m also going to play the Belmont Stakes Double starting Friday Race #10 Belmont Gold Cup with Saturdays Race #11 Belmont Stakes: $2 8/2,4,5,8. Looking above, I think I’ll play Sigi’s Daily Double also. He’s been on fire picking nice singles to play lately. Thank you Sigi for taking the time to pick and play and good luck to the runners, their connections and everyone playing this weekend.